We're poets and lovers of poetry who, since Bello Bards was founded by Marti Guy in March, 2007, have met in Bellingen on the last Friday of every month at 6:30pm, at varying venues. We are, perhaps it might be said, a 'moveable feast' as well as a travelling band of troubadours and their audience. We always dine together and anyone who wants to get up and have a go reading their own or someone else's poetry, is as welcome as those who just like to listen. Welcome to our online home. Taking Home The World Cup!!! Welcome to Bello Bards online! 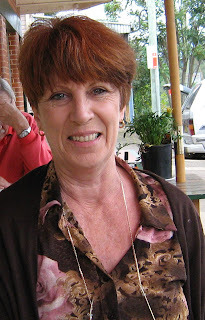 In March, 2007, poetry lover Marti Guy (pictured below) initiated Bello Bards in her bookshop, BellaBooKafe in Church Street, Bellingen (unfortunately now no longer extant), at some considerable expense to herself. She has been the Bello Bards organizer and hostess each month (last Friday of each month, at 6:30 pm) from then until the date of this post. So, thank you, from our hearts, Marti, and, as decided at a meeting of interested parties on May 14, 2010, we now heartily welcome you to BELLO BARDS Blog online. If you want info on Bello Bards and forthcoming gatherings, ask here. Just click the Comments link at the foot of any post, and I'm pretty sure some Bello Bard will reply. Otherwise, just find a Bello Bard and ask them "What's happening?". BELLO BARDS, let's get our poems online here. Contributors to the blog, please send your poems, preferably as attachments, to webservant Pip Wilson, email: wilsonsalmanac [AT] gmail.com, who will post them as soon as he possibly can. IMPORTANT: Please write BELLO BARDS *PLUS* your poem's title and year/s of copyright in your email Subject Header and put your name in the email in order to help your webservant not to miss or lose any poem or email related to our troupe -- thank you. Old and new poems by Bello Bards are all welcome and will be posted ASAP. Submitted poems can be short or quite long, and ought to have a title. I'd think that the only two requirements for publication on this blog are that they are (1) original, and (2) submitted by people who at least occasionally attend Bello Bards poetry functions. and so on, please ensure that you've got those things fixed before sending to your Bello Bards webservant, who is busy and would prefer you or someone else to be your editor unless he's paid an exorbitant editing fee, or something in barter. Your blog administrators will not mess with your poems. Your webservant/s will put a © Copyright, the poet's name, and the current year (or date that the poet proposes) beneath the title of every contributed poem. BELLO BARDS Blog takes no responsibility for any other copyright considerations in Australia nor internationally -- that must be the responsibility of the poets who contribute. We hope to have more webservants here soon, and will announce that when it happens. I, Wilson, don't wish to do the whole shebang, I just wanted to kick it off. I hope it's been kicked off to your '(I Can't Get No) Satisfaction'. The preferred format is .RTF file, but .DOC files and .TXT files are acceptable and even poems in emails. But if you can send in .RTF, please do so. If you're unsure how to do that, there are tutorials on the Net that you can google. If you can't google, google 'how to google'. Poems may also be submitted in hard copy (yawn), but that just means a lot of extra work for admin/s of the BELLO BARDS Blog. It's the Digital Age, friends. Please see it as a poet's opportunity, not a poet's encumbrance. Brian Hawkins, aka 'Birdman Brian' and 'Hawkeye', recites at Bello Bards. The foreground gentleman in gold attire is a regular and usually welcome guest. The NPPWC is on again this weekend! 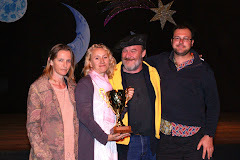 I am off to Nimbin this weekend to judge the finals of the Nimbin performance poetry World Cup 2011 ... and looking forward to being in a position of real power at last!! Mwa hahaha! Iain , Marty and I are off to Nimbin and looking forward to seeing what is on offer this year. My car was declared OK to travel ( I picked up my new (used) Toyota Rav 4 on friday, was rear ended on Sunday and it won't be worked on until next week but the prognosis is good and the damage is superficial and not affecting the body of the car... thank the gods I had comprehensive!!). Is anyone else from Bello going to make it this year? Brian Birdman has organised a get together at the Bello CWA ... BYO ... gold coin donation ...6.30 for 7pm ! See you there! I've created a new page called About Pip at http:www.wilsonsalmanac.com. The indifference about me getting murdered in Bellingen staggers me, but I carry on, with a new poem called 'Jezza' at poetry.html. and the joke that that is. they said it proved, you were mentally impaired. Apart from Lizu's recent call for more poetic contributions to the blog, you have to dig a long way down to find any poems (and there are quite a few). Is it possible to have a sidebar that says 'poems' that takes you to the archive? 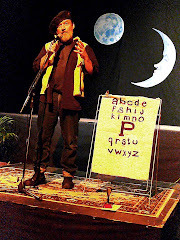 "The weekend (of the inaugural Bellingen Readers & Writers Festival) had many highlights but a standout moment was Friday night's poetry slam, which saw more than 300 (actually it was more like half that! 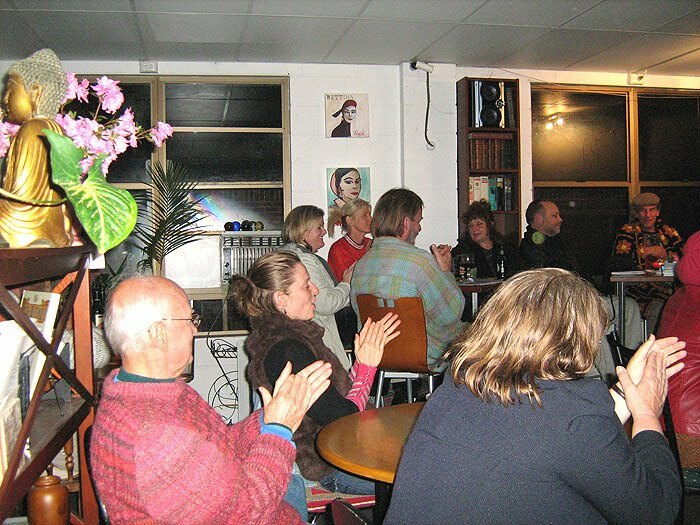 )pack into the local bowling club to watch performances by poets from near and far. 'There is a real appetite to see this page to stage with poetry ... the high energy of the performances was really exciting'" Coffs Coast Advocate, April 11. 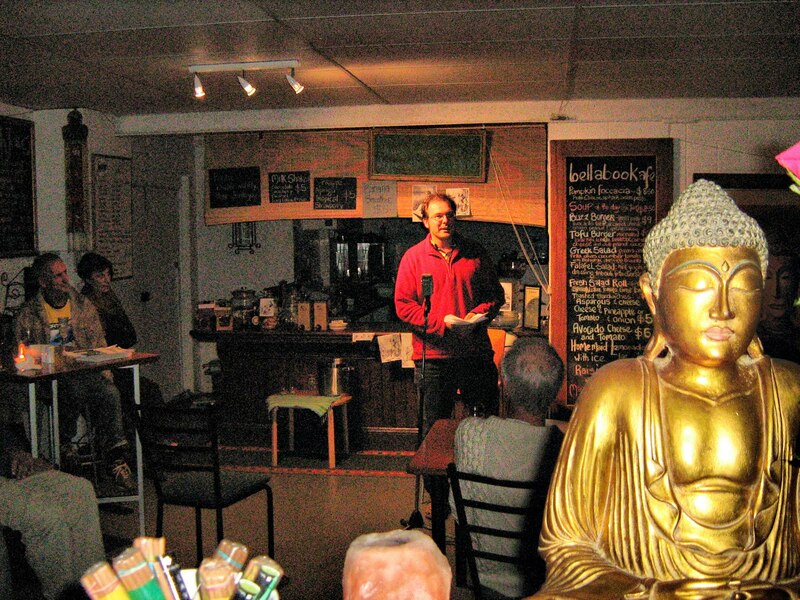 "That evening a huge crowd attended the Bellingen Bowling Club for the region's first ever Poetry Slam. Over 200 people packed the club to see local and regional poets and performers take to the stage... the winners of the event reprised their brilliant performances at Saturday night Live in the Memorial hall, where festival guest authors showed off their multiple talents as musicians and performers" The Courier Sun, April 13. Congratulations to finalists Robin Archbold, Darkwing Dub, Brian Hawkins, Craig Nelson and John Moyes. Also fantastic that there were young and younger contenders for the prize... Ran MC, Aron, Emilie and Crystal.... special mention to Sean, passing through town via Melbourne and Tassie, his love poem received aawws and sighs!We had visitors from Nimbin and Queensland. It really was a fantastic night of entertainment! Well done Bello Bards including Cherie, Kaye, Steve, Peter, Fiona and Will! It would be good for this event to be a success, so that down the track there will be more opportunities for local writers and poets to air their work, promote their work and expand their readership! So if you can afford it I would encourage you to check out the program at www.brwf.com.au and pick a session or two ... weekend passes have not sold well so there will be individual sessions available. Last Call for Poets of Distinktion Poetry Slam! Memidex is a free online dictionary and thesaurus, best I've seen, and very useful for many poets. It's published by Serge Bohdjalian. Last Friday is now the first saturday ...for this month! 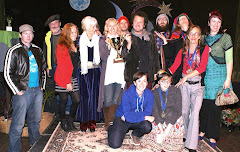 The Bello Bards will be meeting at The Bellingen Bowling Club Saturday April 2! Priority will be given to those entering into The Slam to get up and practice their 3 minute poems! Well it's looking to be a great night out! We have 17 registrations for performance including Robin Archbold and Darkwing Dub, who will definately raise the bar! They are both incredible, dynamic performance poets. 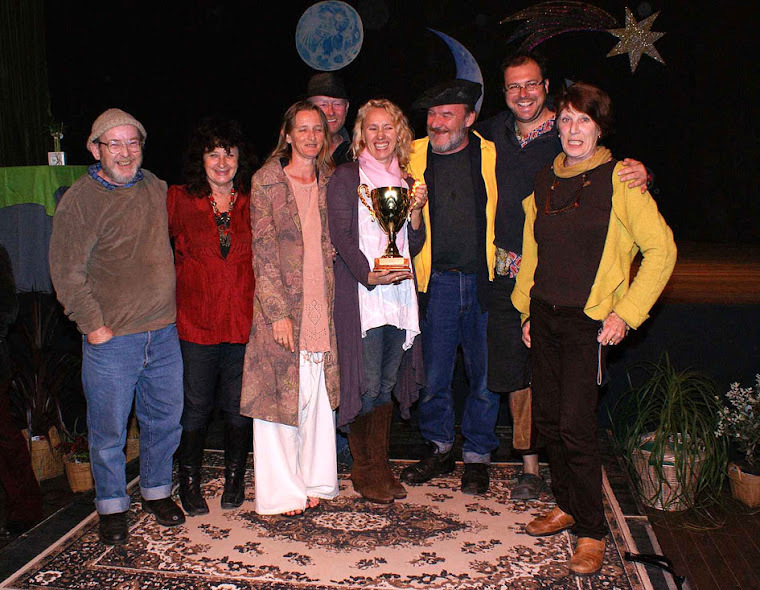 The organisers of The Bellingen Readers & Writers festival are also offering The Winner and The Runner up a spot at Saturday Night Live 7.30 -9.30 at The Bellingen Memorial Hall on Saturday 9th April ... so the performance Poets will be mixing it up with the Literati!! This month we will meet at the Bellingen Bowling Club ... we want to kick off at 7 PM ... See you there! 1. Poetry is original, written & performed by poet. 2. Poet must have 3 poems prepared - in case they get through each round! 4. Poetry should be learnt and performed. NOT read (Poets will lose marks if they read, unless they are really, really good!). 5. No poems that have previously WON in other Slam Events can be used. 6. Judges will be briefed on looking at; content, performance skills and audience reaction to the poems. 7. Judges chosen from audience (2) must not be partners, family or best mates with the poets! 10. No heckling during performance!! (Audience)Poets may heckle whenever they like ! 11. No props, beat boxes, music, visual aids ... just you and your voice! Numbers limitied for Distinktion Poetry Slam! The maximum registrations for the event will be 20, ten will go through to the 2nd round and 5 to the last round! We already have 4 registrations including the dynamic Robin Archbold! Remember you have to be prepared with 3 poems that are maximum 3 mins long! Our own Marty Guy is sponsoring the Peoples Choice award of $200!! Get ready for a great night April 8th, 8pm at the Bellingen Bowling Club! We already have a couple of registrati0ns for the Slam ... remember spots are limited to 20 poets, and you must have performance ready 3 poems , no more than 3 minutes long !! Tooo Easy! Register your details with Liz at lizr71@bigpond.com ( I just need name /phone/ email / address ). $10 payable on the night. Details for registration / rulesfor the Slam will be up on the BRWF web site in the next week, but basically you will be directed to register with me by emailing lizr71@bigpond.com with your details. Basically there will be a registration fee of $10 for poets entering the competition, payable on the night. Numbers will be limited so get in quickly; because it is all happening on the one night there will be a cut off at 20 poets and round 2 will be culled by the judges to 10, then round 3, 5 poets. Two of the judges will be taken from the audience on the night. there will be an entry fee of $5 to the Bowlo on the night. Our very own Marty Guy is sponsoring The Peoples Choice award with a generous offer of $200. Bellingen Cellars on Hyde St is providing $100 for the runner up! We hope all you local poets will support the event... that some of you will enter in to the comp and look to setting a good standard for making it bigger and better in 2012. Bello Bards will also have some time in the tent that will be in the park opposite the Mem hall on the Saturday of the BRWF, so if you find that the Slam is a bit overwhelming you might want to read then. We will need assistance on the night ... time keeper / score keeper, sound person, on the door etc so any volunteers will be most welcome. Calling all Slam Poets ! Is poetry extinkt or are YOU a Poet of Distinktion ! Express yourself! Tell your story, your way! Stand up and be counted! Poets of Distinktion poetry Slam! 3 Rounds, 3 poems, 3 minutes max, 3 judges! The Bello Bards welcome any visitors and newcomers to the first reading of 2011. As usual it is the last Friday of the month. We will be meeting at 6pm Friday Jan 28th @ The Federal Hotel , upstairs on the veranda. We will aslo be discussing our involvement in the Bellingen Readers & Writers Festival which kicks off April 8-10. 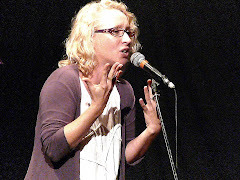 Elizabeth Routledge and Marty Guy will be organising The Poet of Distinktion Poetry Slam which will be happening at 8 pm Friday April 8 at The Bello Bowlo, to register for that go to the BRWF website : http://www.brwf.com.au/ . Peter Stone of Real Estate of Distinction is putting up $500 for the first prize, and Bellinen Cellars $100 for the Runner up... there will be a people's choice award as well. It will cost $10 to register. Another opportunity for Bello poets! Performance and written poetry sections. 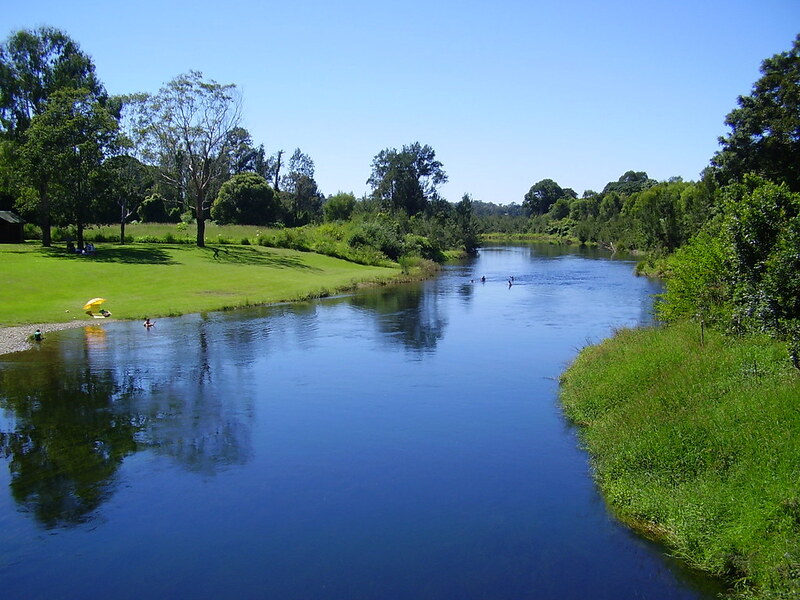 A big welcome home from all of Bello Bards and Bellingen residents. Pip Wilson is back home after many months recovering from a head injury. He will be back posting on the Blog asap! Next Bello Poetry Evening will be in 2011! Marty is going to be overseas until next year and it is the silly season so the next Bello Bards Poetry Meet will be at the end of January. Also we are hoping to get up A Poetry Slam event as part of the inaugural Bellingen Readers and Writers Festival - April 8-10. At this stage it will be individual poets competing for a prize ($500, plus runner up and peoples choice prizes; but there will be 3 rounds, 3 min time limit on the poems ( possibly one open round )and 3 judges ... poems must be original and performed! We are looking at by 2012 having teams of three poets compete, i.e. from regional NSW and beyond! So all you slam poets, spoken word artists, performance art writers, rap, punk & hip hop (sub) Urban word performers ...GET WRITING!! More info will be posted as soon as we have things locked in! The Prominance of P ... a non-Power Point presentation!